Moves to make non-European history compulsory at Oxford University do not go far enough, an anti-colonial campaign group claims. Rhodes Must Fall Oxford, which seeks to address Oxford's "colonial legacy", said the history syllabus remains "hugely Eurocentric". It reacted after Oxford made completion of one paper in non-European history compulsory for history undergraduates. The university said it was pleased to be diversifying its curriculum. It said the move "followed years of discussion" and was not a response to any campaign. The likes of the "Why is My Curriculum White?" 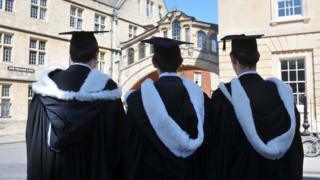 campaign have been encouraging UK universities to cover more "non-white" topics. Neil Gregor, professor of modern European history at the University of Southampton, described the move as "long overdue", and said there was a "widely acknowledged need to make history less Eurocentric". But, he also criticised some of the media reaction to the changes, which he said carried "an implicit accusation this is PC [political correctness] gone mad" based on the assumption global history means black history. He added it was a "delusion" to think British or European history could be taught without some consideration of global history. Femi Nylander, from Rhodes Must Fall Oxford, said the "real question" was why non-European history did not become compulsory on the syllabus of "the world's supposedly best institution" until 2017.